Add all the dry ingredients (nuts, coconut, flaxseeds, spices, salt, and sugar if using) to a large bowl and stir. In a separate bowl, mash together bananas and ghee/coconut oil. Add to large bowl with dry ingredients and stir well until a sticky dough is formed. This might be easier to do with your (clean) hands. On a parchment lined baking sheet, use your hands to crumble or “sprinkle” the granola dough, dispersing small pieces across the sheet. Bake at 250 F (low and slow!) for about 2-2.5 hours. 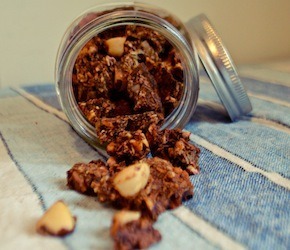 In this time, the granola should dehydrate and crisp up a bit, a brown a bit at the edges. Check at the halfway point to give the granola a quick shuffle and break up and flip larger pieces. When baking time is done, allow granola to cool and store in the fridge or serve over organic yogurt, or milk of choice, or eaten as-is as a snack!